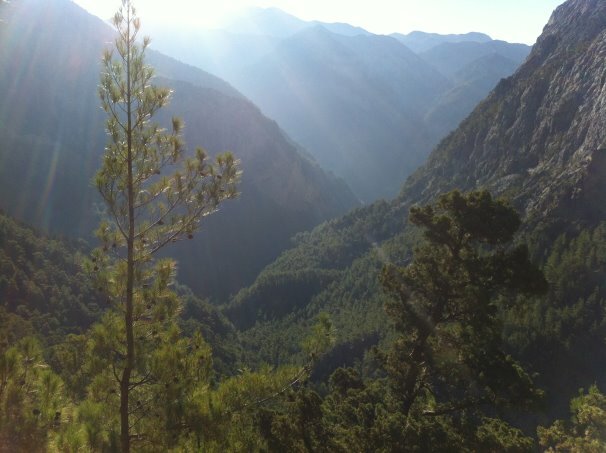 Samaria Gorge or Samaria or Farangas as locals call it is a National Park of Greece in south west Crete. Samaria gorge lies near Chania town, on the western part of the island. 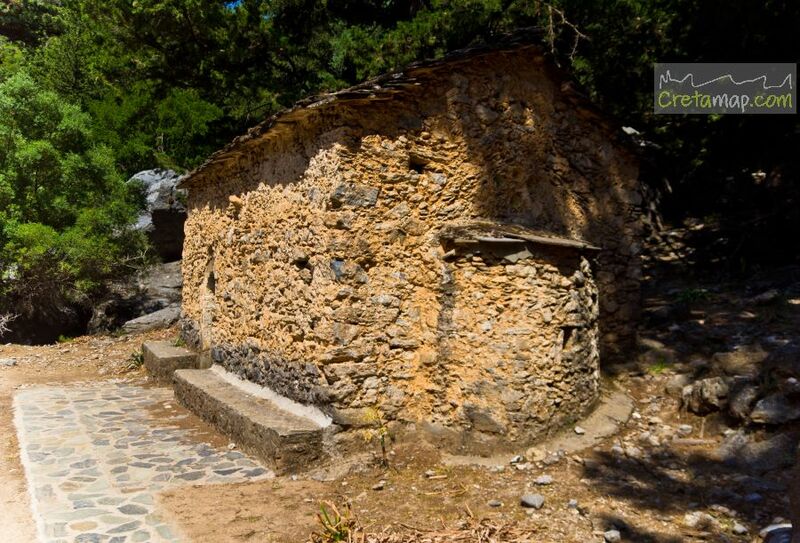 It starts at Xyloskalo (about 1250m above sea level) on the Omalos Plateau and ends at the village of Agia Roumeli on the south coast of Crete. 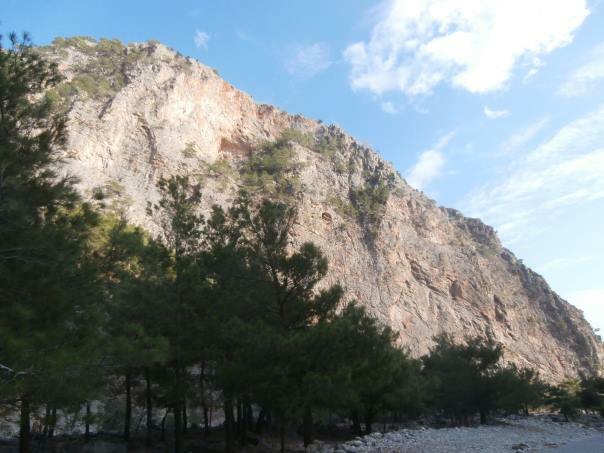 It was created by a river running between the mountains Lefka Ori (i.e. White Mountains) and Mt. Volakias. 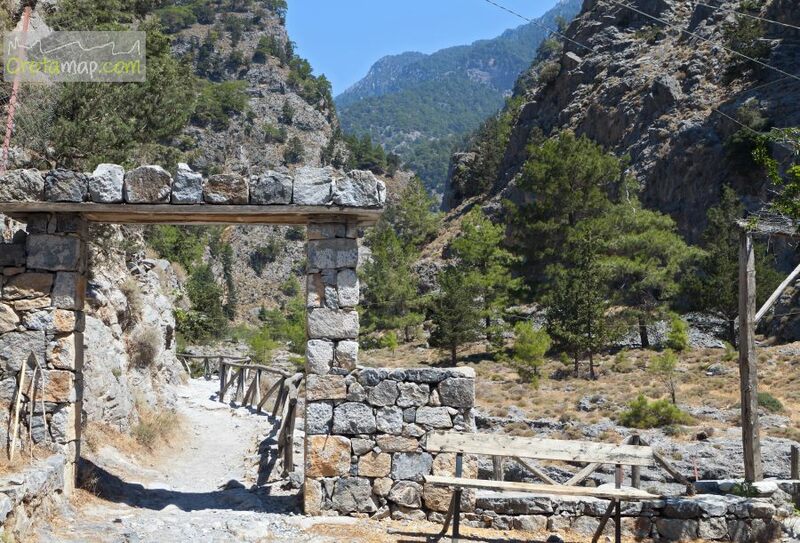 The Samaria Gorge is the most famous and most imposing gorge in Europe. The length of the passage to the limits of the park is 12,8km and the distance to the coast of Agia Roumeli is another 3,2km, reaching 16km (10mi) length in total. 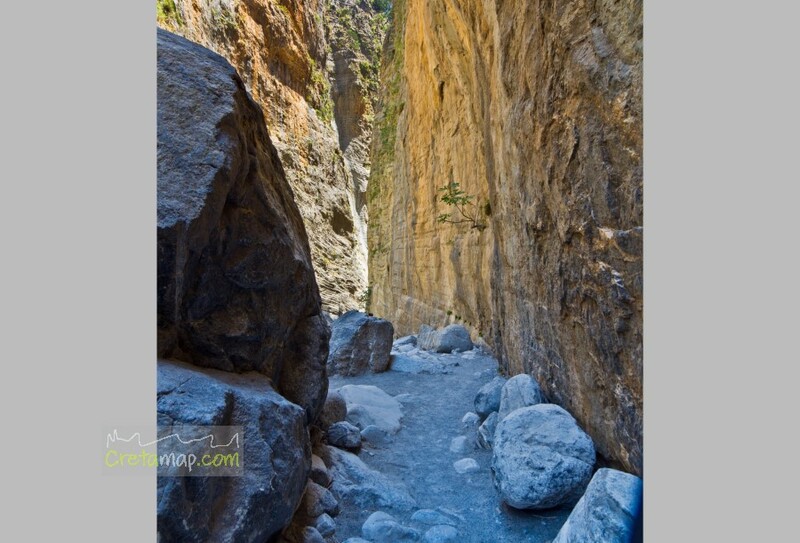 It has a lot of narrow passes most famous of which is the one near the end, called “Sideroportes” (i.e. Iron Gates), widely known as “Portes” (i.e. doors or gates). At the Iron Gates, the sides of the gorge are only 4m wide and almost 300 to 700m high. 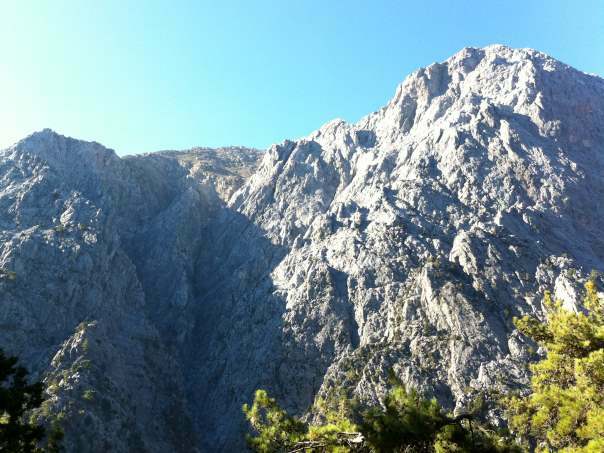 Samaria National Park is a unique biotope with rare geo-morphological formations and is exceptionally rich in fauna and flora. It features huge pine and cypress trees, once used in shipbuilding, and about 450 plant species, 70 of which are endemic, (i.e. 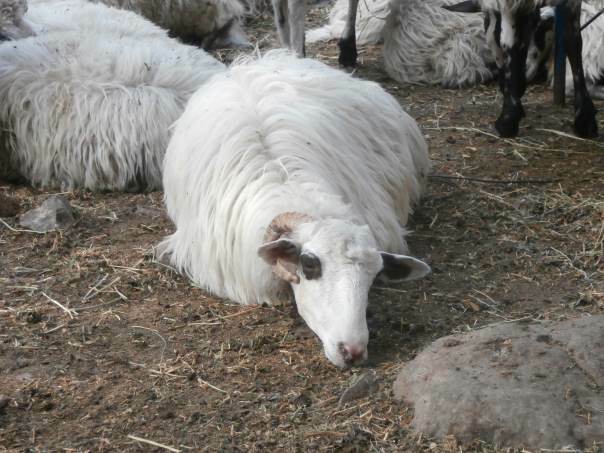 they grow in the gorge only) and are protected under international law. 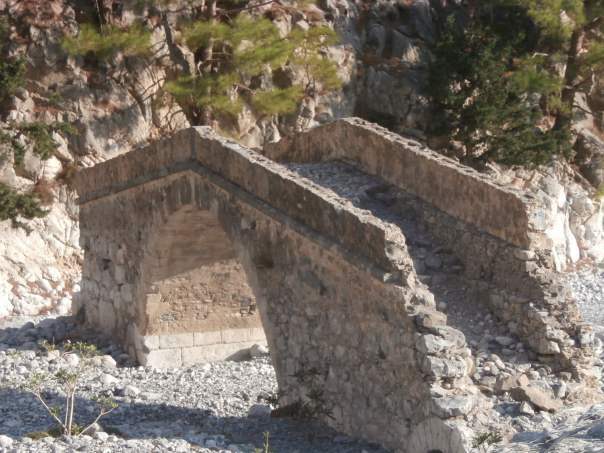 The gorge became a national park in 1962, as a refuge for the rare kri-kri (wild Cretan goat), which you may see near the village of Samaria, situated halfway of the gorge. 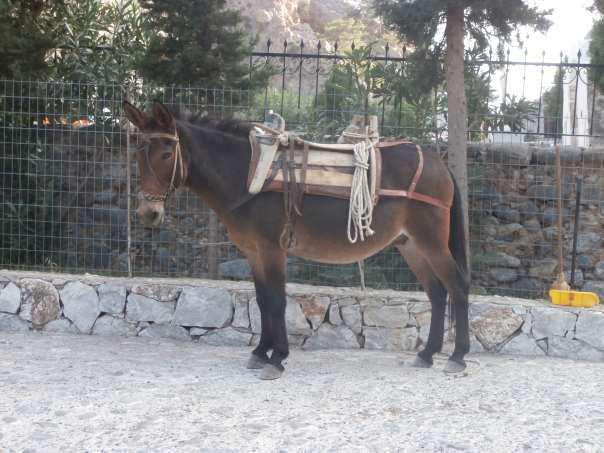 These animals are endimec and restricted mainly to Samaria gorge and an island called Theodorou or Thodorou, just off the shore of Agia Marina, west of the town of Chania. When the gorge was declared a national park, few Sfakian families still lived in the village of Samaria. Their old houses still exist, serving as houses for the guards. A little further down from the village is the 14th century church of Osia Maria (i.e. Holy Mary), from which the name “Samaria” is derived. The gorge is awarded countless prizes and is supervised by the Department of Forestry. 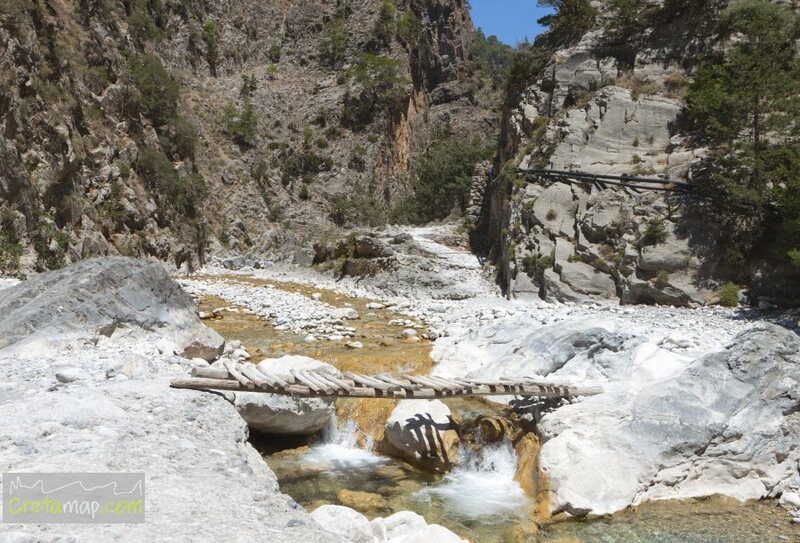 The gorge usually opens to the public from the 1st of May, depending on the weather and the restoration work that is required after the winter rainfalls. Βoth entrances -Xyloskalo and Agia Roumeli- are open from 6 am until 4 pm. It closes to the public at the end of October. A sudden rainstorm may result to forbid entry to the gorge so as to avoid accidents. The entrance fee is 5 Euros. The best period to visit the gorge is during spring when the weather is cool and the rare vegetation at its best. The worst time is during a heat wave in summertime, in which case it is advisable to come again at a better time. Within the park it is strictly prohibited to camp, stay overnight or light fires. For the above reasons the gorge is open only during daytime and if you wish to start walking in the afternoon you will only be allowed up to a certain point. Additionally, you will also be asked to present your ticket about 3km before the exit by the guardhouses of the Park. There are toilets at various points along the gorge and plenty of rubbish bins. Τhe footpath is well maintained and signposted all along its length and as it is usually very crowded, it is impossible to get lost. During the high peak season the number of visitors per day could be some thousands of people. If you wish to avoid the crowds, either seek for cheap accommodation at Omalos -beginning of the gorge- and start walking at dawn, before the numerous tourist buses arrive or start after 12.00 in which case you will most probably have to spend the night in Agia Roumeli since the last boat will have left by the time you get there. There are wardens along the way to help you in case of trouble or injury. A doctor and a helicopter airport are also available in Agia Roumeli. You will get a set of rules, aimed at protecting the park and making the experience safe and pleasant for everyone. The gorge is not recommended for children under 10 years old and for people with knee problems. You may be accompanied by your dog but it has to be on a leash at all times. 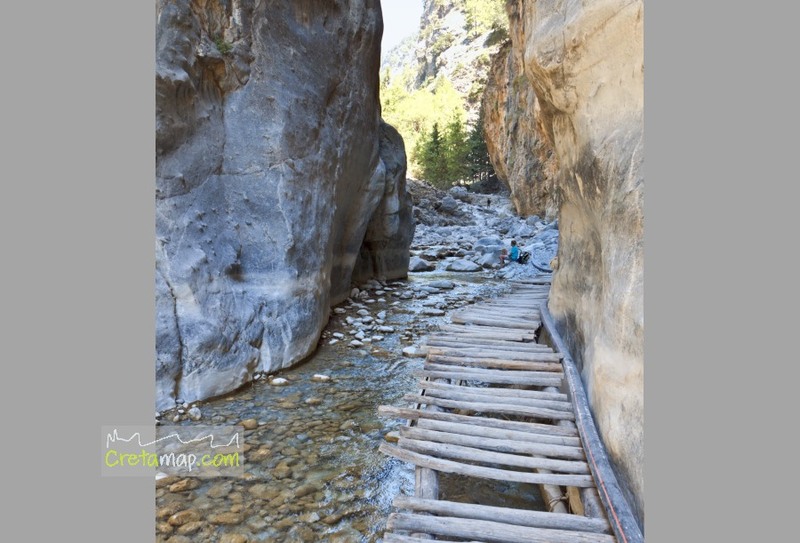 Samaria gorge is not a simple walk for those unused to walking. As long as you have no serious medical problems, you are able to cross the gorge but bear in mind that as it is going mostly downhill, it is very strenuous to the knees. The terrain is mostly stony hence a good pair of shoes is an imperative. Sunscreen and a hat are of high importance, especially for the last 3km as there is no shade and it can be really hot in summer. Some food, as there is nothing available to purchase inside the gorge. A jumper for the early morning. Bandages in case of an accident. It is very important to drink a lot of water, so have a water bottle which you can refill at the various water springs along the gorge. Avoid stopping for a rest or shout below high cliffs as it increases the risk of stones falling. Always look at where you are going and most importantly stop whenever you wish to take a picture or enjoy the scenery. Go slow during the first 2km as the path is very steep and the stones rather slippery. Crossing the gorge can take five or fewer hours, although it is preferable not to walk less than 6 to 8 hours so as to to fully enjoy it. 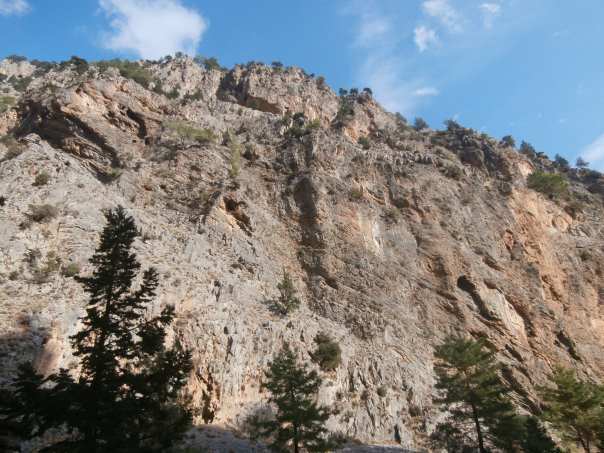 There are two entrances to the gorge of Samaria: one in the north at the Omalos Plateau and one in the south at Agia Roumeli. Take a taxi to Omalos so as to to retrieve your car as there are no public buses running from Chania to Omalos in the afternoon. Take a public bus or another taxi, in case it is late in the afternoon, to reach the destination you have left your car. 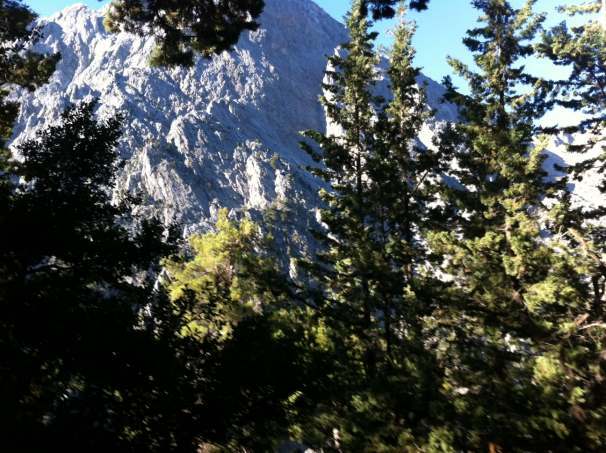 Should you consider the above ways to visit the Samaria gorge, always check the Ktel public buses timetable which may alter depending on the season of year. The two recommended ways to visit the gorge are by either using public transport or booking an organised tour. The cheapest way to reach the Omalos Plateau is to take the early public bus going to Omalos from Chania. The buses depart from the Ktel Central Bus Station in Chania and are marked “OMALOS”. Tickets for the two buses can be reserved at the ticket office at the Ktel bus station in Chania. The morning buses take one hour. 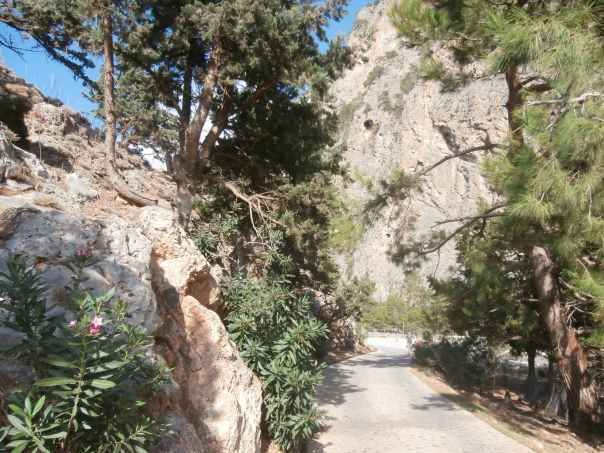 The gorge ends at the village of Agia Roumeli, a village with restaurants, accommodation and an idyllic beach. There are no roads in Agia Roumeli, therefore you will have to wait for the ferry to Chora Sfakion and take the connecting public bus back to Chania. The above can also be done from Paleochora or Sougia where the ferry also stops, although the buses leaving to Chania could be some hours later, therefore it is advisable to do a prior check on the bus timetable in case you wish to stop at the above villages. 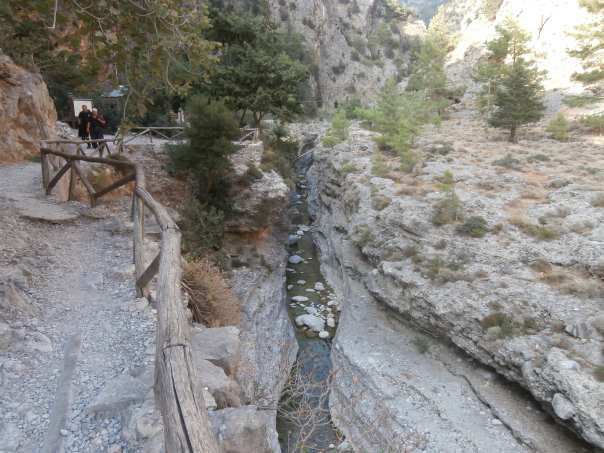 Another way is to participate in one of the excursions to the gorge organised by the several travel agencies in Crete which can be done from most places on the north coast of the island. These tours are not very expensive, considering that you will be picked up from and returned to your hotel. Their prices include fare for the buses and the tour guide but don’t include the ferry tickets and the entrance fee to the gorge. The ticket for the ferry can be purchased only in Agia Roumeli. Open from: 1st of May to late October depending upon the current weather conditions. As the only way out of Agia Roumeli is the ferry, it is possible that the weather conditions won't allow for the ferries to depart, in which case it is advisable to still have ample time left in Crete!